Diving closed circuit oxygen rebreathers requires planning to make sure that the diver is not exposed to a too high partial pressure of oxygen for a too long time. The article describes how this is planned in the civilian and the military world. Humans require oxygen in order to convert food to energy just like a fire needs fuel and oxygen to keep burning. We operate at peak performance at a 24% oxygen level and at sealevel on earth the air consists of 21% oxygen. Most people start experiencing problems when the oxygen level goes below 17% which for instance mountaineers experiences on high altitues. When the oxygen level falls below 8% most people will go unconscious. Examing our oxygen dependancy more closely reveals that what we really need is an enough amount of oxygen molecules. That means that if we increase the pressure four times, like diving on 30 meters depth, we can survive on a quarter of the oxygen level or 5% oxygen in the breathing gas. There is a special name for the combination of pressure and oxygen percentage which is "oxygen partial pressure" or simply ppO2 for short. So 5% oxygen with 4 times the pressure would be expressed as a partial pressure of 0.20 bar (0.05 * 4). It is however not only too low levels of oxygen that can be dangerous but also too high levels of oxygen. If someone would be exposed to a partial pressure of 3 bar (20 meters depth if someone breaths 100% oxygen) they would after a couple of minutes suffer severe body convulsions and go unconsiousness. The body of the victim would first become totally stiff for 30 to 60 seconds which is known as the tonic phase. After the tonic phase the victim will relax for 60 to 120 seconds and hyperventilate which is known as the clonic phase. If the diver is brought to the surface and treated he will most likely survive. The purpose of the rest of this article is to descibe the best way to prevent oxygen toxicity symptoms and how to save a victim suffering these symptoms. The table below shows the maximum time limit for different oxygen partial pressures. Note that partial pressures of 1.5 and 1.6 bar (marked in red) are only for emergency and should not be used in planning. Successive dive times are calculated using the percentage of the daily maximum exposure. For instance you can do one dive with ppO2 1.4 for 90 minutes and one dive with ppO2 1.2 for 120 minutes. Each dive consumes 50% of the allowed 24 hour exposure time. Alternatively if you after your first dive noticed that you spend 60 min on ppO2 1.4 that is 33% of total dose. Then you have 67% left for the ppO2 1.2 dive which is 160 minutes (240 * 0.67). In order to do a successive dive you also have to make sure your surface interval is long enough. Minimum surface intervals are listed below. Military closed circuit rebreather diving requires buddy lines. A buddy line is a short line connecting both divers. So if one diver suffers oxygen poisoning then the other diver would be able to save his buddy. If you are a CMAS certified diver then you should already be well aware of the use of buddy lines. Buddy lines are also needed when diving in dark and muddy waters. It is strongly recommended that you use a buddy line! Military exposure times for the LAR V closed circuit rebreather are expressed in relation to depth. The corresponding oxygen partial pressure for different oxygen fractions are added to the table as a reference. The fraction of oxygen in the breathing bag is depending on how well the bag is purged when enetering the water. Purging using the normal procedure with three purges will if using a converted Dolphin Dr䧥r unit raise the oxygen level to 80%. If a new dive is attempted within two hours then the maximum exposure time on the previous dive must be subtracted from current maximum dive time using the maximum depth of both dives. For instance a diver first does one dive for 60 minutes at 8 meters depth then surfaces for 75 minutes. The second dive will be 6 meters deep. How long can he stay at 6 meters depth? 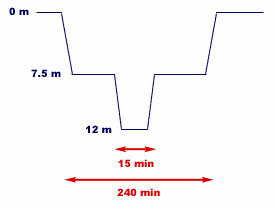 According to the rules the deepest of the two dives should be used for successive dives with surface intervals below two hours. Maximum time for 8 meters depth (deepest of the two dives) is 80 minutes. Since 60 minutes time is used then the second dive has to be limited to 20 minutes. A maximum of 4 hours oxygen time is allowed within 24 hours. Excursions are temporary short visitis to depths greater than the maximum depth for the entire dive. If a military diver decides to stay above 7.5 meter for most of the dive one excursion to 12 meter for 15 minutes is allowed. Alternatively he could make one 5 minute excursion down to 15 meter. An excursion is only allowed if the diver stays on 7.5 or shallower water. A 240 minute dive with a 15 minute excursion. The symptoms can be remembered using the abbreviation CONVENTID. 4. Ascend to the surface in a controlled manner slightly squezing his chest to prevent water in lungs. 5. Pull divers head back to open airways on surface. Don't put your fingers in his mouth and try to clear it. It won't help much and you will suffer severe injuries if diver still convulsing. 6. Do mouth to mouth breathing if diver has stopped convulsing and is not breathing. 7. Get to shore or boat.